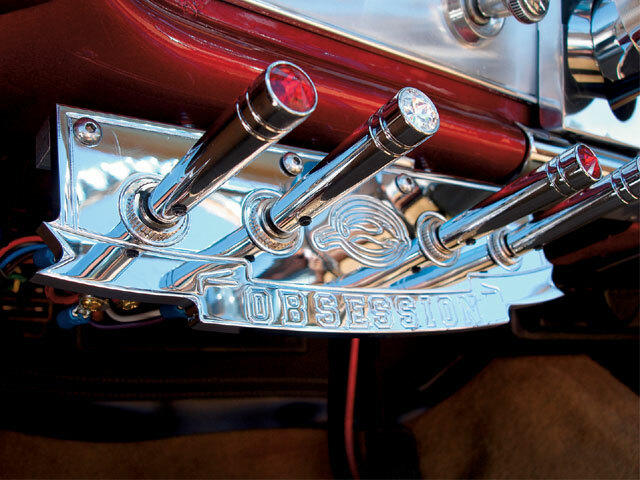 This Pair Of Red-Hot Ragtops Keeps Things Hoppin' Down South. 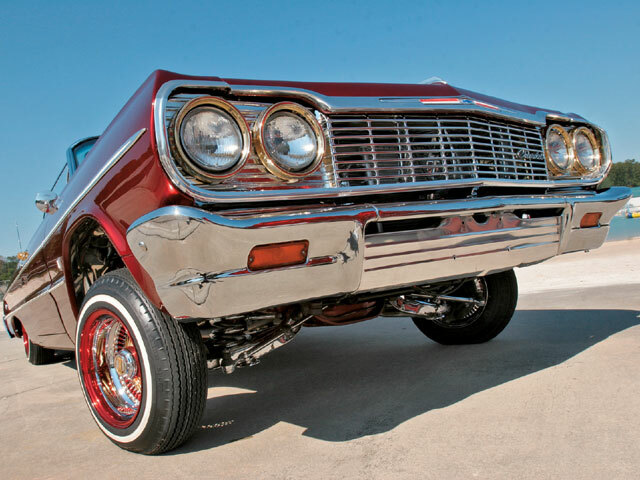 Red-hot lowriders are popping up all over the country these days. 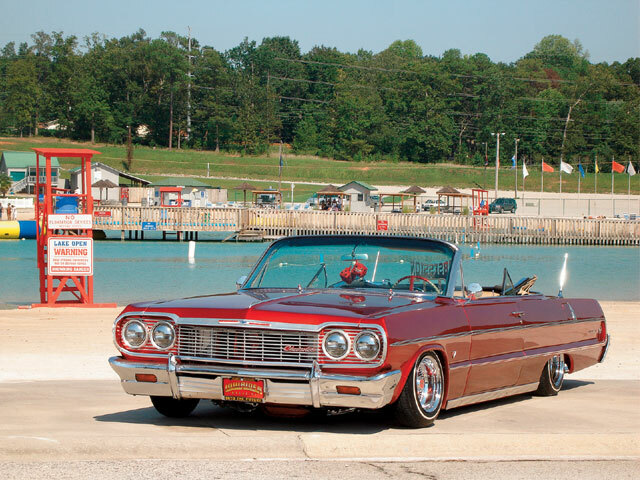 Some of these cars arise organically when local natives get inspired to build a ride like nothing else around, while others are imported from lowriding hot spots when their owners move to town. 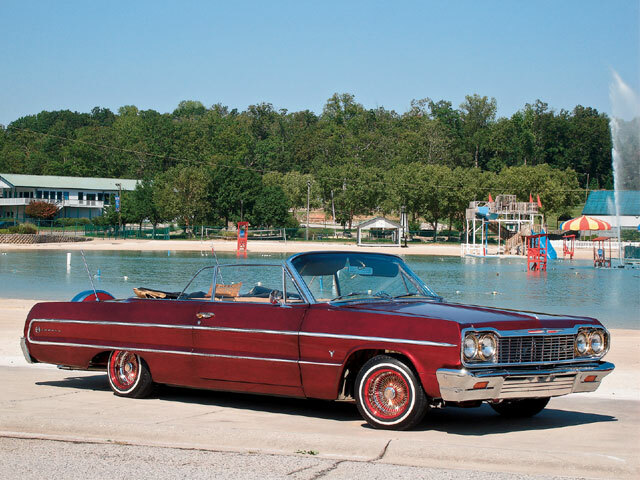 Obsession Car Club has been flying its colors in the South for a while now, a nd this pair of ’64 Chevy Impala convertibles belong to a couple of transplanted lowriders from points west now ma king good in the Southland. Leading off our pair of red-hot ragtops is “Red Ride In Da hood” belonging to 28-year-old Keith Whitner of Lawrenceville, Georgia. A former professional ballplayer in the Detroit Tigers organization, Keith now runs Jack City baseball in Lawrenceville, a training facility where area youngsters can learn baseball fundamentals fundamentals from former big leaguers. 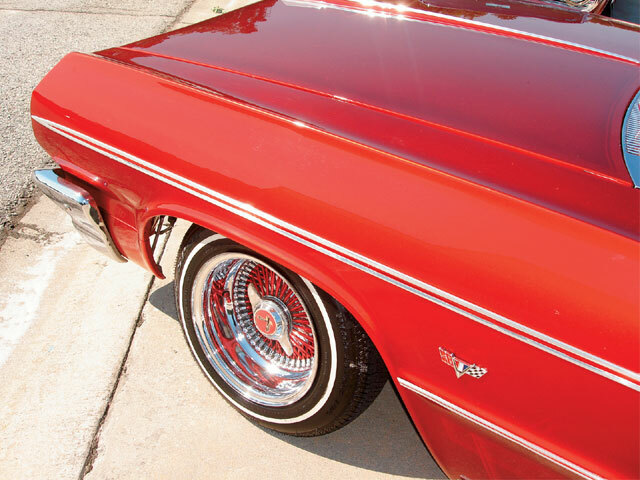 Baseball and his family, including wife, Lisa, and kids Kielan and Kayla Maria, are Keith’s top priorities, but lowriding isn’t far down the list. 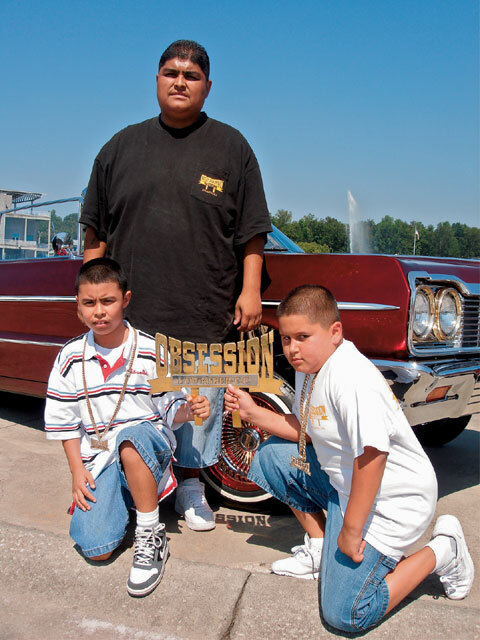 “Growing up in Denver, Colorado, I’d always seen lowriders cruising around,” Arturo remembers. 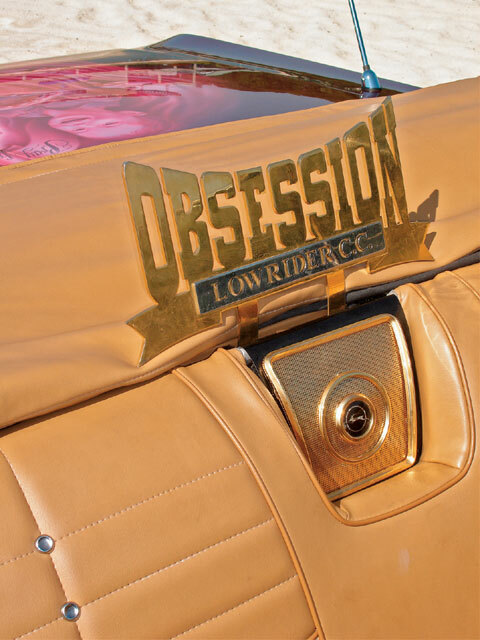 “I bought the ’64 for myself when I finished high school.” Thanks to the support of his wife and family, along with Jose, Marty and Perry from Obsession C.C., the car has slowly been transformed over the past decade into one of the cleanest ragtops anywhere, north, east, south or west. Red Ride In Da HoodOwner: Keith WhitnerVehicle: ’64 Chevrolet Impala convertibleCity/State: Lawrenceville, GeorgiaClub: Obsession C.C. Engine/Drivetrain: Jared Freelan at State Collision in Lawrenceville rebuilt the ’64 327-c.i.d. engine. Terry at Georgia Classic got the transmission into gear. Body/Paint: Cliff Johnson at C.J. 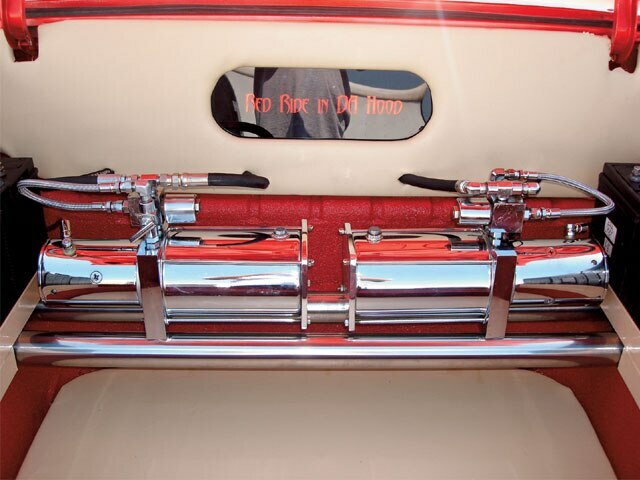 Customs in Atlanta, Georgia, applied the house of Kolor candy apple red finish. Peach Plating in Atlanta did a sweet job on the inner fenders, A-arms, rearend and other chrome areas. Interior: edgar brito at brito’s Trim Shop in Atlanta stitched up the tan seats and panels. Sound System: Keith puts the hits on blast with a Kenwood head unit/CD player and speakers installed by Manny of Obsession C.C. 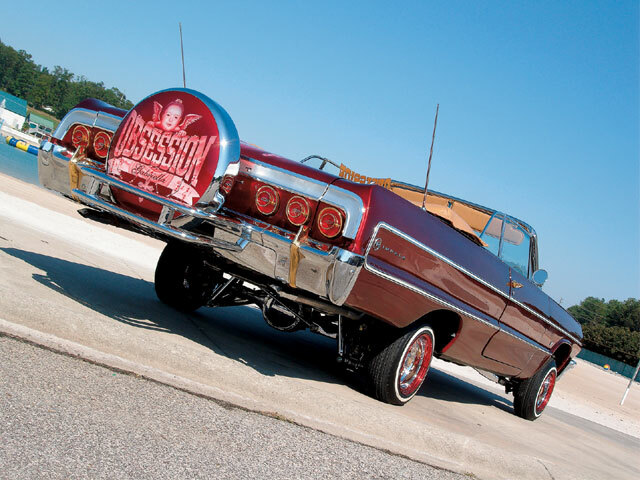 Setup: Perry bunker at Obsession’s backyard boogie in Atlanta put “da hood” into Keith’s red ride with a two-pump Pro hopper hydraulics setup featuring two chrome Delta dumps, 10-inch (front) and 14-inch (rear) cylinders, Accomax solenoids, 3-ton springs, four switches and eight batteries. The x-frame was reinforced with “1/4-inch [plate] 100-percent [bumper to bumper]” by neal’s Customs in Atlanta. Firme ’64Owner: Arturo ReyesVehicle: ’64 Chevrolet Impala convertibleCity/State: Opelika, AlabamaClub: Obsession C.C. Engine/Drivetrain: Greg at R&n in Auburn, Alabama, reworked the ’64 283-c.i.d. 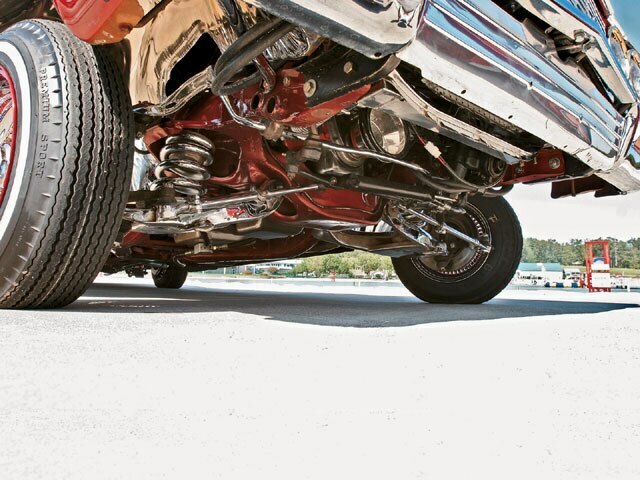 Chevy small-block with a serpentine belt system, be Cool radiator, stainless steel exhaust and Powerglide transmission. 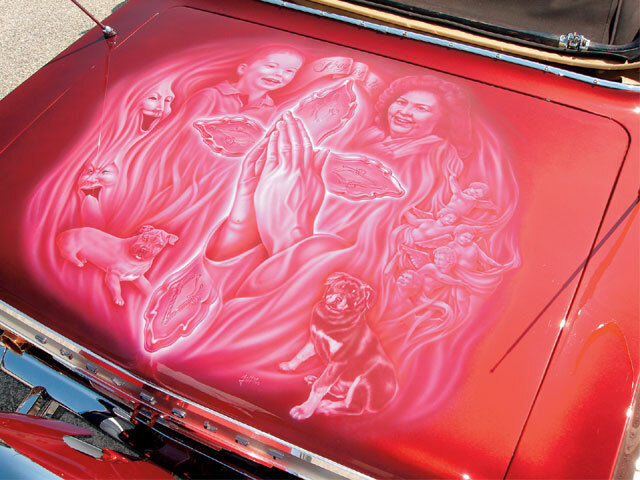 Body/Paint: Also in Auburn, Mike at Masters Paint & body did a masterful job on the house of Kolor candy burgundy red paint. The trunk mural featuring members of Arturo’s family was handled by homer of Atlanta. 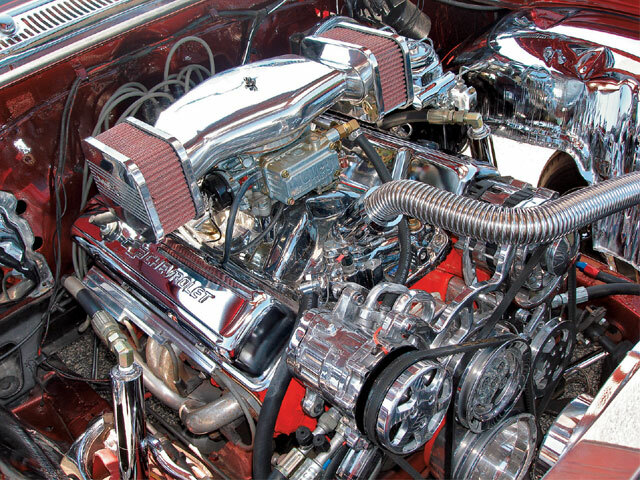 The plentiful plating found under the hood and under the car came courtesy of Foster’s Chrome Plating in Douglasville, Georgia. 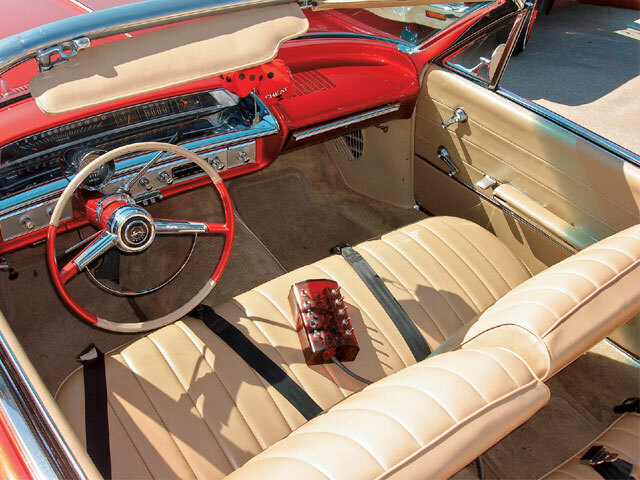 Interior: Joe at Southern upholstery in Auburn gets the credit for the peanut butter-colored upholstery that stretches to the dash. 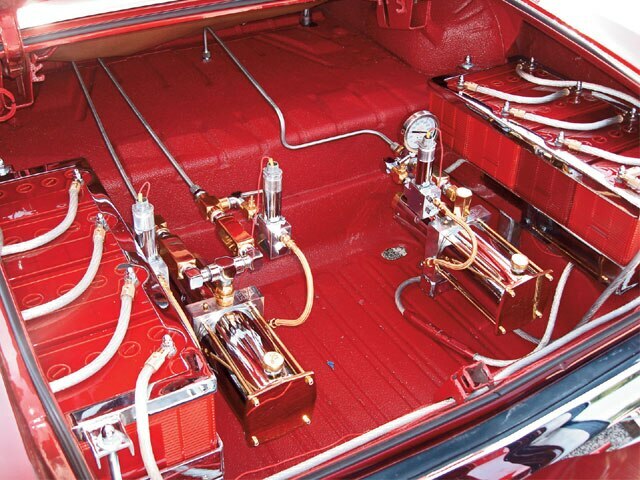 Sound System: StealthSetup: Perry bunker at Obsession’s backyard boogie in Atlanta helped Arturo and Jose Reyes with a gold and chrome hi-Low hydraulics setup that incorporates Adel dumps, 8-inch (front) and 10-inch (rear) cylinders, 3-ton springs, four switches and eight Deka batteries. The x-frame was wrapped by Mike at Masters Paint & body.